A pretty lousy movie with nothing going on other than the end of the world background, and two people traveling around together for no good reason at all. Here is a movie that has a pretty interesting end of the world concept. Instead of an end of the world movie about a group of buddies hanging out together and trying to survive, let us make it about a single guy who has just been dumped and is now trying to find love. I will take it so long as it is still a comedy. Seeking a friend for the end of the world is not. There are funny scenes in it, once in a while, but saying it like that is being generous. The movie is more serious, depressing, and slow moving than anything else. This wants to be a powerful, symbolic movie, but it forgets how ridiculous the end of the world concept is, and how much that lends itself to comedy. Having Steve Carrel, a great comic actor, as the lead, makes the fact that this is a sad, dull movie, all the more unforgivable. Seeking A Friend For The End Of The World is a very bad movie made around a pretty decent concept. That concept is what would happen is a guy who was single found out that the world was about to end. What would happen to society all around him? There have been other movies about this, (most recently the movies this is the end and the worlds end), but unlike those movies which go for mostly comedy, seeking a friend goes for drama and romance. Those are mistakes. Especially since Steve Carrel is the lead. This movie should have gone for comedy just like those others, because after all, it is a completely ridiculous situation, so why get realistic and depressing about it? Why not has some fun with the idea instead? Steve Carrell is a fine actor and has great comedic timing. He does not cameo in enough movies, but when he does, like in anchorman, he is at his best. He starred in The 40 Year Old Virgin, which was really his break out film, and then made a handful of lousy comedies like Evan Almighty. If not for his long running role on the TV show the office, one might think that he was not as talented as his original break through films would have you believe. Something likes the way that Jim Carrey has fallen. In addition, like Carrey, Steve Carrell keeps trying to branch out into these serious or semi-serious roles. With little miss sunshine, Carrell did pull it off; only that movie was undoubtedly a black comedy. It was not a drama or a romance or anything else. Then there are movies like this or like Dan in real life, where depression is the name of the game. Even his role in crazy, stupid, love (a movie that I still think has an awful title), was not as funny as it should have been because he had to be the depressed, mope character. He’ the guy who gets dumped or gets cheated on. That is exactly what happens here, in seeking a friend for the end of the world. When the movie begins, we are in the car with Carrel’s character, dodge, and his wife. They listen to a radio broadcast about how the world is coming to an end and she gets out of the car and walks off. This is her way of leaving him, just like that. Now dodge is suddenly single. He goes to a party thrown by a couple who has an interesting take on the end of the world situation. The members of the couple are rob Cordry and Connie Britton. These two have pretty much given up on rules and are all about kicking back and having fun. Cordry lets his kids drink alcohol and even encourages them to do so. Britton tries to come onto dodge. When he turns her down, she asks how come his wife is the only one who gets to do whatever she wants. The party scene happens to be the funniest and liveliest scene in the whole movie. Other than these two actors, Patton Oswald is also on hand, showing up as a guest who is as single as dodge, but is approaching the situation very differently. For the Oswald character, Roach, life has become all about sleeping with as many women as possible. He sleeps with a different woman each night and loves that they do not care about getting pregnant or about getting diseases, or about financial stability and responsibility. Basically, all rules have gone out the window and Roach is taking full advantage. However, unfortunately we get the one character that is a downer to follow. This movie would have been totally different and about a thousand times better if it was about the Roache character and his approach to the end of the world, instead of the mopey dodge. His friends want to set dodge up with someone, only he does not want to jump into something with a girl simply because he doesn’t want to be a lone in the end. It does not matter to him what happens in the last few minutes alive. He can be by himself for all he cares. Especially if it means having to spend the time up until that point, surrounding himself with someone annoying. Then one night, he meets Penny (Keira Knightly) who is at least two decades younger than him, and crying outside of his window. Penny is having issues with her boyfriend who she has just broken up with. Aside from that, she is sad because her family is in London and she fears that she will never see them again. Dodge incites her in, and the two of them start spending time together. They watch TV and talk about life, and penny learns of a woman named Olivia, who dodge used to be in love with. She also tells him that his wife was cheating on him, without realizing, what she is saying or knowing that the woman was his wife. The two of these characters now set out on a road trip to accomplish two goals. First, they want to find Olivia for dodge. Penny turns over some of his letters that she has been keeping (what? why is he not furious with her over this? ), and it turns out that one, written three months ago, was from Olivia. Meanwhile, penny needs a plane to fly overseas to see her parents one last time, and dodge tells her that he knows someone who has a plane. The problem is that while these missions could be decent if done the right way, neither one of them really is. Instead of moving forward on these stories, the movie seems a lot more interested in giving cameos to random celebrities who have nothing to do with anything. William Peterson shows up, for example, and so does Derek Luke. In addition, nothing that furthers the story along comes from any of this. Seeking A Friend For The End Of The World ends up getting very slow and lifeless in its second half. The comedy and idea that people might be handling the situation in crazy ways goes right out the window at that point. Instead, this movie almost forgets about its end of the world backdrop for at least a solid thirty minutes, in order to concentrate on the romance. This movie runs out of ideas long before it is ending. All of the stops that they make on this road trip remind me of the Vince Vaughn – Reese Witherspoon film Four Christmases. Like that movie, some of the earlier houses are funny, but eventually the humor runs out of steam, and so does the rest of the movie. This could have been a much, much better film. All one has to do is look at the party scene to see the ways this movie could have gone. It is pretty much a mess of a move to take such a great concept and put a generic storyline over it, to the point where that concept is basically sacrificed and forgotten, for the purpose of the lousy storyline. 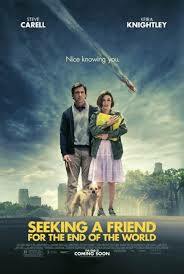 Seeking a friend might have some decent ideas at times, but it could have been a far better film.